Blog | Production Mode Chicago | Artist collaboration, geometric lines, ethical manufacture — by Jamie Hayes. Please join us this Sunday, March 3 at 6 pm at the Sofi­tel Chicago Magnif­i­cent Mile for cham­pagne, hors d’oeuvres, and a fash­ion presen­ta­tion! Produc­tion Mode designer Jamie Hayes will present about the line and her design process while Produc­tion Mode designs are shown by models. We’ll also have a selec­tion of the line (includ­ing a few new pieces!) on hand for you to view and shop before and after the presen­ta­tion. Yarn for the new collec­tion has arrived! This very special wool comes to us from the Bi Daüü coop­er­a­tive, a group of Zapotec arti­sans from Teotitán del Valle in the state of Oaxaca in Mexico. After being spun and natu­rally dyed using cochineal and indigo, the yarn was sent to Philadel­phia to be wound on cones in order to pass through the Weav­ing Mill’s dobby loom. 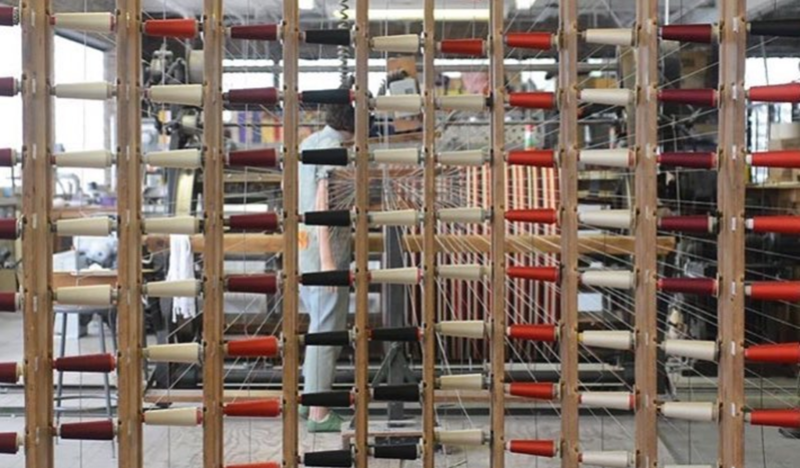 Next we are wait­ing on some adjust­ments to the loom to acco­mo­date this very special yarn. Mean­while, the Weav­ing Mill’s Emily Winter will be work­ing up some yardage on her hand loom, engi­neered espe­cially for the silhou­ettes we will make with it. This project is funded by a grant from the Chicago Depart­ment of Cultural Affairs and Special Events. Keep an eye out for the launch of the collec­tion some­time this summer! Produc­tion Mode in the April issue of NS Modern Luxury, featur­ing our 100% wool felt top and vegetable tanned leather skirt. Full arti­cle on our upcom­ing trunk show at Exhibit Wilmette can be found here. 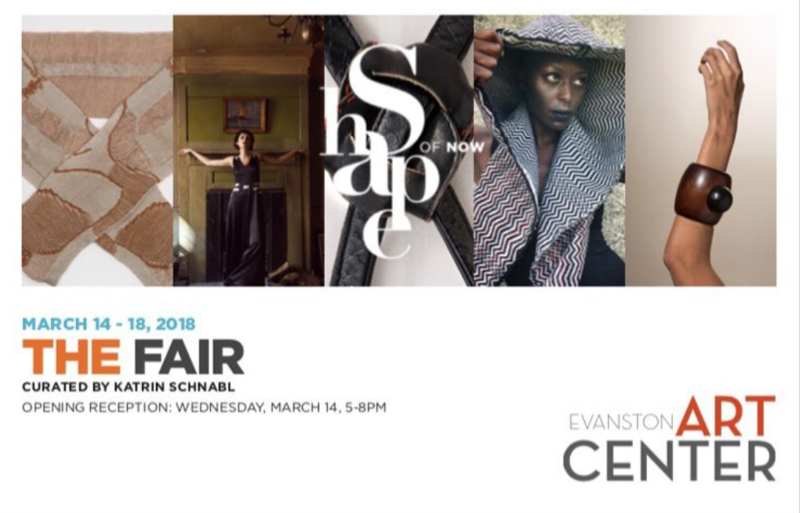 Join us, March 14–18, for The Fair, a curated, shopable exhibit at the Evanston Art Center of some of our favorite Chicago design­ers. The Fair brings together inde­pen­dent fash­ion design­ers arti­sans and collec­tives to present their current spring/summer collec­tions in a unique sales event bene­fit­ting the Evanston Art Center. As a part of the ongo­ing SHAPE OF NOW fash­ion resi­dency series curated by Katrin Schn­abl, the public will have the oppor­tu­nity to shop a curated selec­tion of fash­ion, acces­sories and objects created by the partic­i­pat­ing design­ers and guest artists at THE FAIR, a unique art-meets-fash­ion pop-up show­room at the Evanston Art Center. Each collec­tion offers a unique and refined point-of-view, with garments and items that are care­fully crafted in small series. Whether the focus is on acces­si­bil­ity and collab­o­ra­tion through fash­ion as cham­pi­oned by the bright and play­ful, yet seri­ous work of Radi­cal Visi­bil­ity Collec­tive, sustain­abil­ity and ethi­cal manu­fac­tur­ing prac­tices via ‘slow fash­ion’ as in Jamie Hayes’ Produc­tion Mode, tech­no­log­i­cal inno­va­tion seen in Anke Loh’s knitwear, or on elevat­ing the sensual mate­ri­al­ity of garments and objects through arti­sanal atten­tion, such as Gillion Carrara’s jewelry as well as Andrea Reyn­ders’ and Anna Brown’s collec­tions, new design forms are artic­u­lated through these care­ful consid­er­a­tions. By doing so, design­ers open up new ways of collab­o­ra­tion and collec­tive engage­ment, and create fash­ion as an oppor­tu­nity to partic­i­pate and express our iden­tity by connec­tion to what is impor­tant to us. The Fair will be on display in our First Floor Gallery from March 14 — 18, 2018. This panel discus­sion will offer a window into the creative prac­tices of our design­ers, who will be on hand to intro­duce their work and to share insights into their processes and stories. 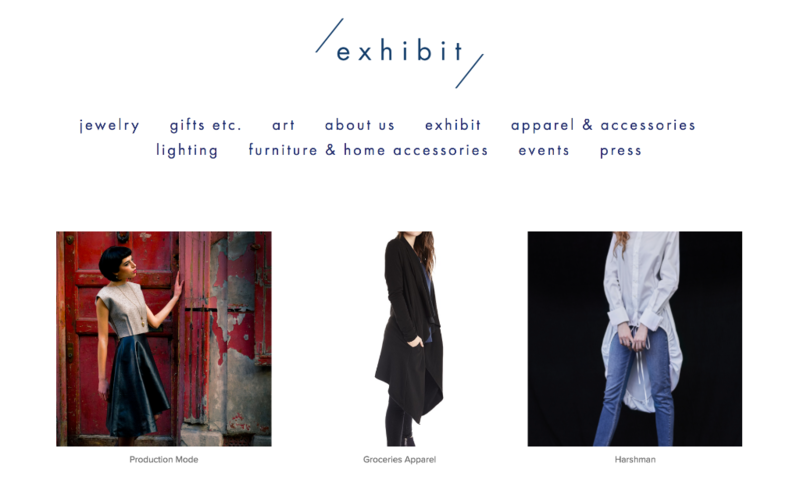 Join us on the evening of Thurs­day, April 19th, 5–8 pm at our newest stock­ist, Exhibit Wilmette. I love Exhibit’s mix of struc­tural inde­pen­dent fash­ion. 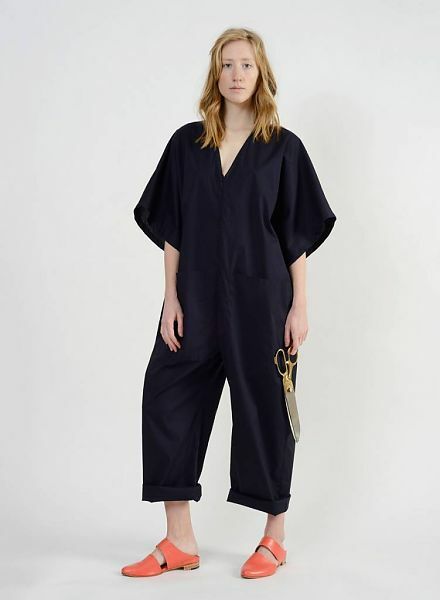 Owner Mari-Rose McManus takes the time to research each brand and designer, and makes sure to source from design­ers who produce in their coun­try of origin. I will be bring­ing the entire Produc­tion Mode line, please join us for an evening of slow fash­ion. 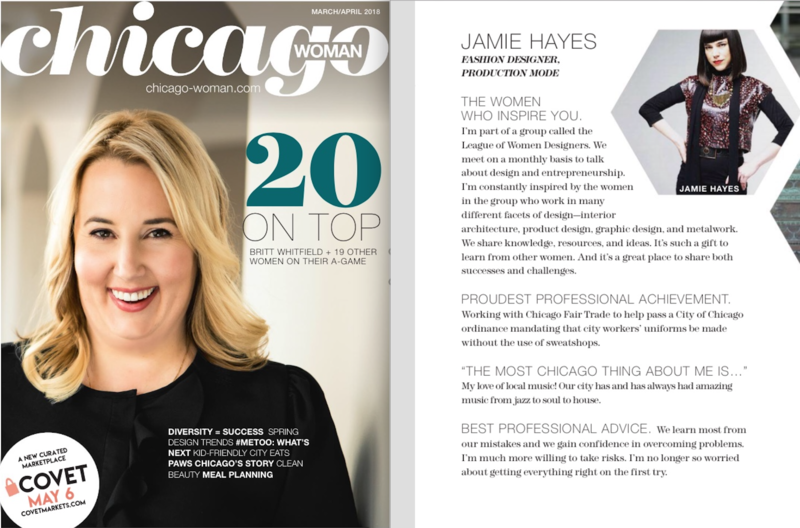 In the Decem­ber 6 issue of the Chicago Reader, Produc­tion Mode designer Jamie Hayes was inter­viewed as part of a story on fash­ion, gender, iden­tity, and poli­tics and the PM collec­tion is featured on the cover and through­out. View the full story here! Photog­ra­phy, illus­tra­tions and collages by Petya Shala­manova. HMU by Andrea Samuels, Styling by Matthew Ancer, Models are Caitlin, Mana, and Cam from Ford. Produc­tion Mode felt skirt featured on Papermagazine.com. Styling by Kit This with assis­tance from Tanner C. Bran­son. Grace wears Alex Carter coat, at Sir & Madame. Alice and Olivia blouse, at Nord­strom. Cities in Dust double disc earrings. Manolo Blah­nik. Cortazia wears Odeeh blouse, at Chalk Evanston. Roland Mouret pants, at Chalk Glen­coe. Balen­ci­aga belt, at Blake. A Détacher slides, at Robin Rich­man. Erica wears Carven sweater, at Chalk Evanston. Produc­tion Mode skirt. Manolo Blah­nik shoes. This fall the Art Insti­tute invited me to acti­vate the exhibit Revoli­ut­siia! Demon­strat­siia! Soviet Art Put to the Test. As part of the exhibit, cura­tors asked differ­ent artists to host an event within the Work­ers Club, a recon­struc­tion of Alek­sandr Rodchenko’s 1925 design, Work­ers Clubs were spaces for leisure and educa­tion for work­ers and their fami­lies located within Soviet facto­ries. I gath­ered ten activist/artists to discuss the ques­tion: What is the role of the artist/activist in dark polit­i­cal times?” Our group spent the morn­ing discussing our own expe­ri­ences with art and social justice, and the inter­sec­tion of the two. We talked about the fallacy of think­ing of time and evolu­tion as linear, and also the hubris that artists alone can rein­vent soci­ety. We also talked about the impor­tance of contin­u­ing to make art, polit­i­cal or other­wise, as the act of creat­ing keeps us vibrant and helps us to dream of a better, more just and loving future. The exhibit explores the role of artists in build­ing soci­ety during the time period imme­di­ately follow­ing the Soviet Revo­lu­tion, and incred­i­bly rich period of art history. This period of Russ­ian Construc­tivism is espe­cially influ­en­tial to my work, not only aesthet­i­cally, but also in terms of the way that Construc­tivist artists consid­ered the whole cycle of produc­tion. Artists like Stepanova and Popova under­stood the impor­tance of cloth­ing design, and consid­ered the design of the 2-D print in rela­tion to the cut of the cloth­ing to produce 3-dimen­sional shapes on the body. They designed so as to waste as little cloth as possi­ble, work­ing directly with textile mills to inte­grate the surface pattern design with the patterns used to cut the cloth. They also under­stood fashion’s role in creat­ing iden­tity within soci­ety. In fact, already in the early 1920s, they were using design to ques­tion and subvert gender and class roles. It was a time when the “lesser arts” like cloth­ing and textile design were consid­ered to be of the utmost impor­tance because of their preva­lence through­out soci­ety and due to the intense amount of human and natural resources required to produce cloth­ing. In addi­tion, gender equity was a pillar of the revo­lu­tion, so tradi­tion­ally “femi­nine” arts like cloth­ing design, as well as female artists like Stepanova and Popova, were well respected at the time. The exhibit runs through Janu­ary 15, 2018. Thank you to Annemarie Strassel, Abigail Glaum-Lath­bury, Ayesha Jaco, Damon Locks, Hoda Katebi, Char­lie Vinz, Eve Fine­man, Megha Rala­p­ati, & Terri Kapsalis for join­ing me in the discus­sion. We invite you to the launch of our new collec­tion, MOVE/REPEAT, at our produc­tion space/showroom, Depart­ment of Curiosi­ties. The collec­tion will be avail­able for purchase at special preview prices as a thank you to early support­ers. 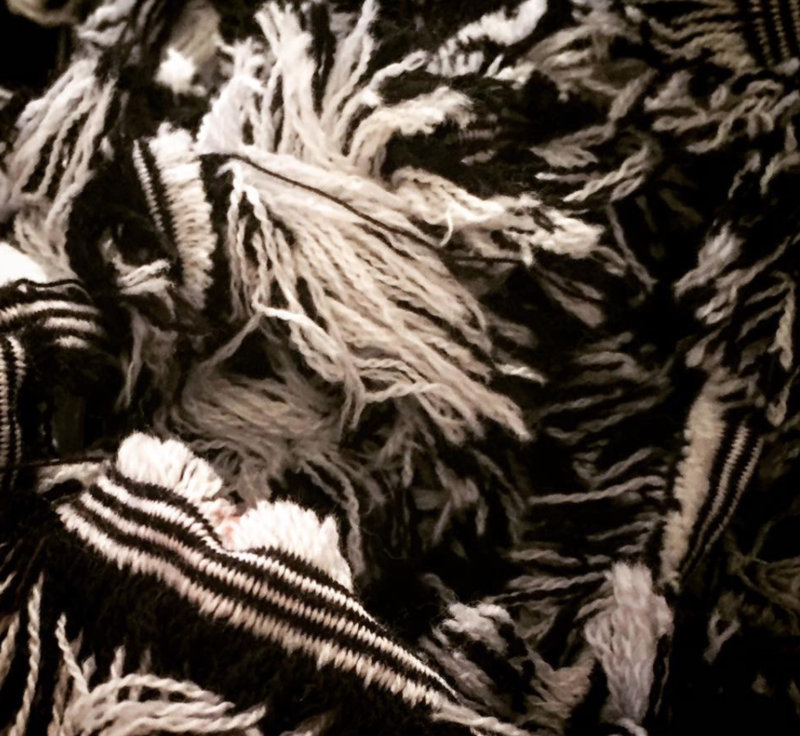 The collec­tion features textiles designed and woven in Chicago by our neigh­bors, The Weav­ing Mill. 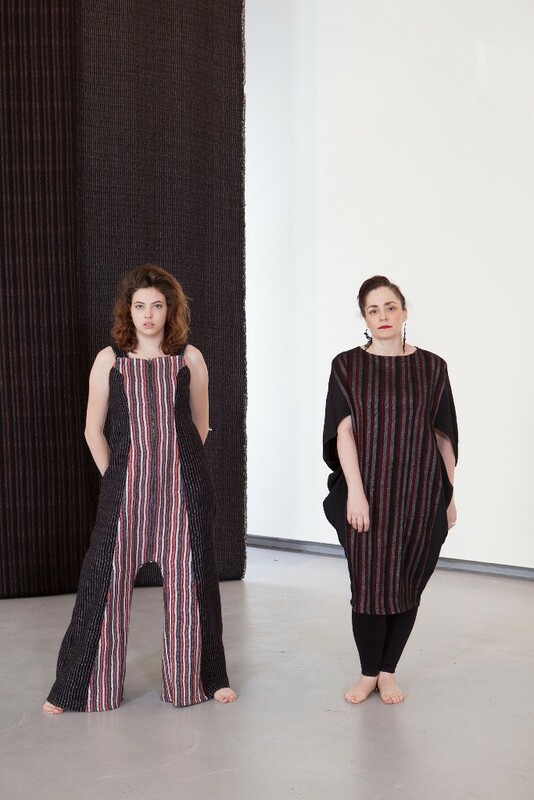 We spent over a year devel­op­ing the textiles, a felted merino wool/cotton blend, in collab­o­ra­tion with Mexico City-based artist Nuria Montiel. The result­ing weav­ings inspired by her draw­ings and art prac­tice. We then devel­oped a collec­tion of wrapped and draped capes, tunics, hoods, and over­sized coats that cocoon and cloak the wearer. All items are designed, cut, and sewn in our Logan Square studio follow­ing a slow fash­ion model of ethi­cal produc­tion. 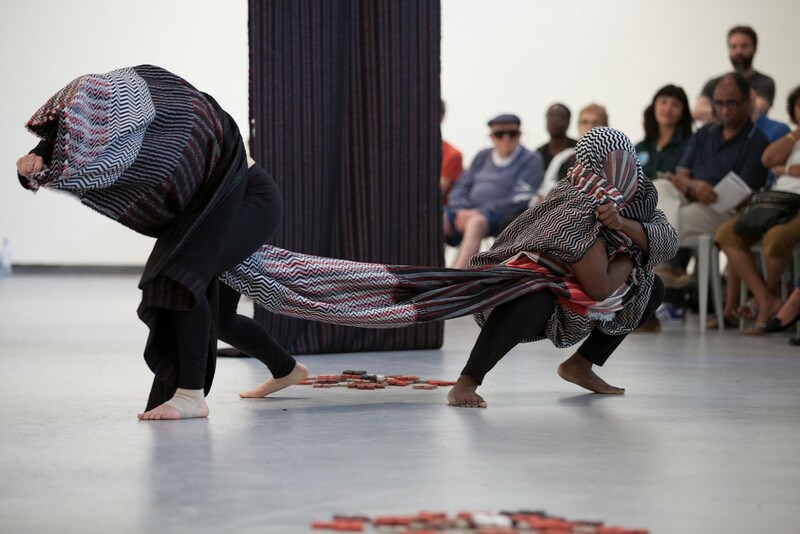 In July we debuted the work on dancers in a piece chore­o­graphed by Anna Martine White­head, with music by Damon Locks, and set pieces by Nuria Montiel at the Hyde Park Art Center. We now are coming full circle to present the work in our work­shop, an inti­mate setting where pieces can be tried on and fitted at your leisure. Also on view will be the first Produc­tion Mode Collec­tion, the full Depart­ment of Curiosi­ties collec­tion, and Morua corsetry and couture, all made in the Depart­ment of Curiosi­ties space. Join us as we cele­brate the launch of our new collec­tion! Produc­tion Mode warp getting ready to be put on the loom at the Weav­ing Mill. Photo still from the film “Floor­plan” by Julia Dratel. 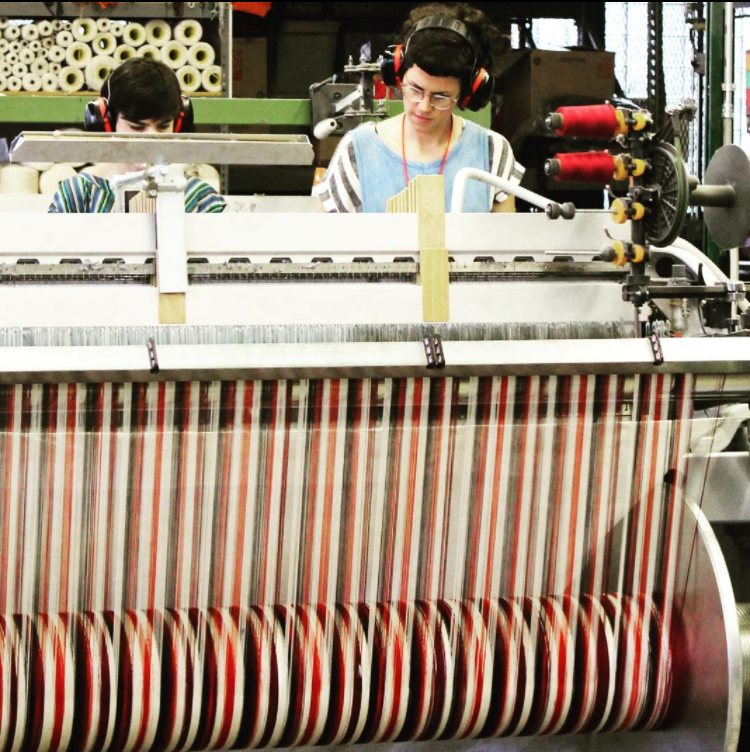 Martine White­head (L) & Keyierra Collins ® wrapped in the “sketch” blan­ket created by the Weav­ing Mill to final­ize textile designs on the loom. Photo by Sara Pooley from the MOVE/REPEAT perfor­mance. Production Mode MOVE/REPEAT Collection Debut on 7/7! 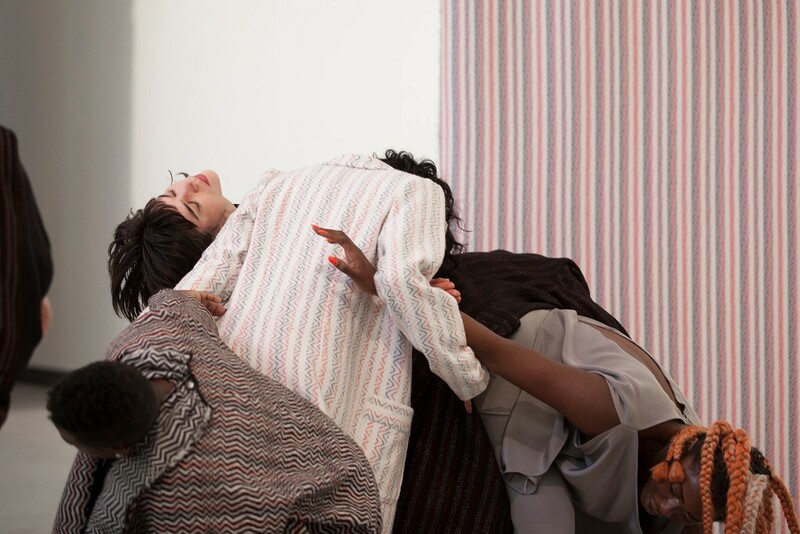 The new Produc­tion Mode collec­tion premieres Friday, July 7th, at Hyde Park Art Center with a dance perfor­mance chore­o­graphed by Anna Martine White­head, set pieces by Nuria Montiel Perez Grovas and live elec­tronic music by Damon Locks. The dancers will perform in the collec­tion. 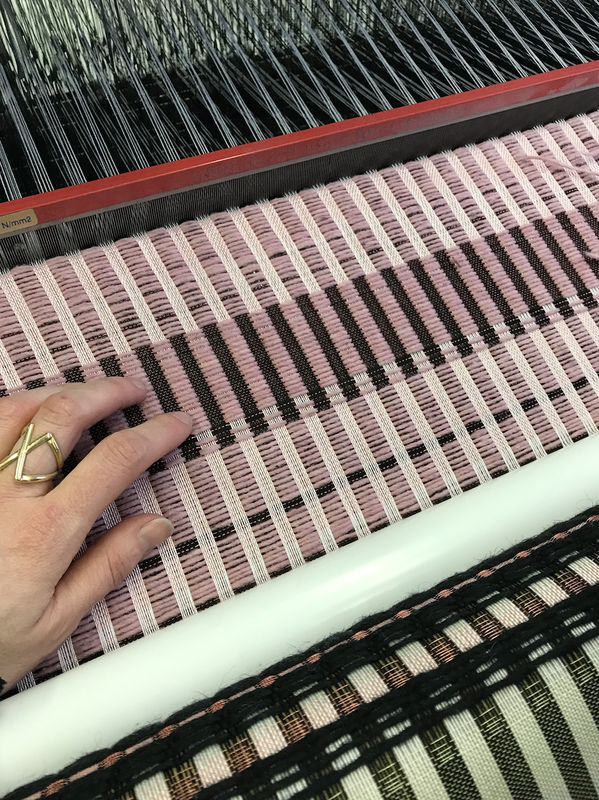 Emily Winter ® of The Weav­ing Mill sampling on the loom to final­ize textile designs for the Produc­tion Mode collec­tion along with PM designer Jamie Hayes (L). 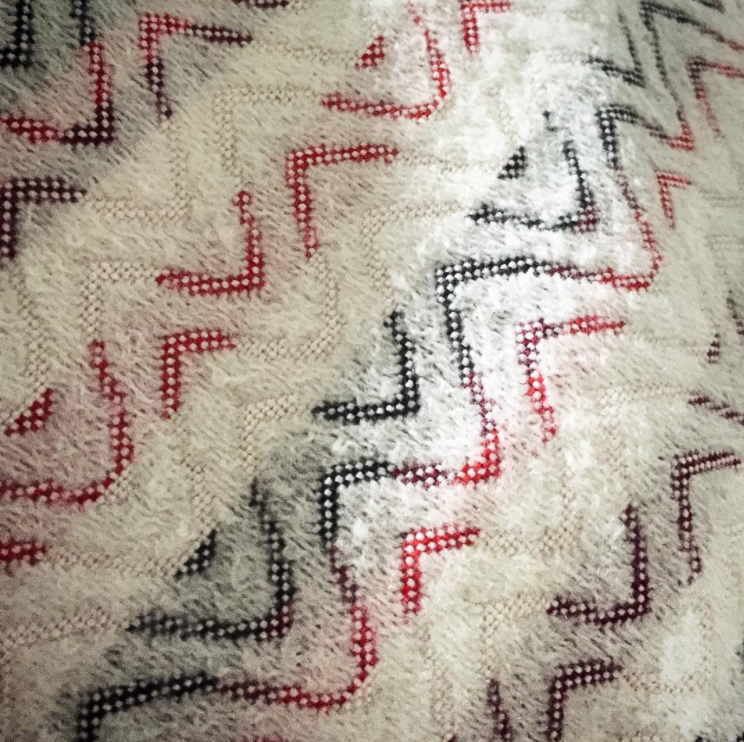 The collec­tion features 5 custom textiles, made of felted merino wool/cotton woven in Chicago by the Weav­ing Mill in collab­o­ra­tion with Nuria Montiel. As always, the collec­tion is designed, cut and sewn in-house at our studio/showroom, Depart­ment of Curiosi­ties. Expect draped, wrapped, and twisted silhou­ettes, combined with soft, tailored pieces–blankets and wraps to cocoon in. 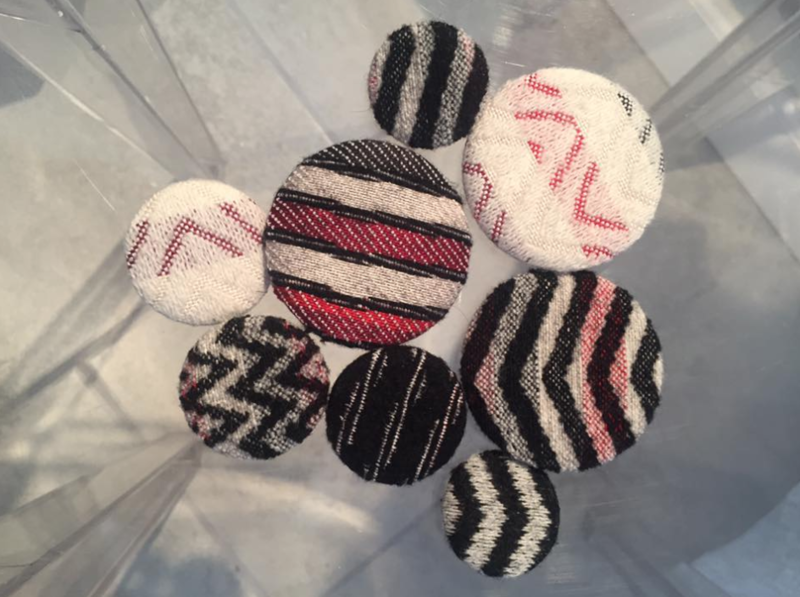 Many of the pieces in the new collec­tion are designed to be worn in multi­ple ways, so will come with with pins made at Busy Beaver Button Co. to allow the wearer to play with styling.